Choux Choux Charcuterie is a new deli in downtown Victoria where Luke Young and Paige Symones are making many of their own excellent sausages and pates. Drop by and tell them you saw them on PacificPalate.com! This week I featured a discussion with Dr. Harvey Anderson, a professor of nutrition at the University of Toronto. He also sits on a global advisory panel for McDonald's advising them on healthier menus. You can check out McDonald's efforts at www.mcdonalds.ca. Of particular interest is last year's Canadian Corporate Social Responsibility Report, Section V, Health and Wellness. You also heard clips from Morgan Spurlock's Film, Super Size Me. You can buy the documentary from Amazon.ca, and visit his website. For more indepth reading on the effect fast food has had on America, Fast Food Nation by Eric Schlosser is a must-read. It has been on best seller lists for years. To listen to my entire conversation with Dr. Harvey Anderson, download my latest podcast click here. During my honeymoon we spent a week cycling through the eastern end of France's Loire Valley. Our base was Le Vieux Moulin near Nevers, where we had many excellent dinners as part of the package. It's a great way to cover a lot of ground without having to re-pack every night. This gets a Pacificpalate.com recommendation! This week it's a visit to a market in a small town in France, then back to Canadian author Angela Murrill's home away from home to cook it! 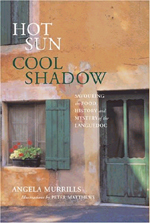 Angela wrote a book called Hot Sun, Cool Shadows, about the history and food of the Languedoc Region of France. Her husband Peter Matthews illustrated the text, and you can tag along by ordering it through my website!